The only wafer-style LED G4 Bipin lamp with a rotatable base available in the landscape lighting industry. This direct replacement G4 Bi-Pin LED lamp will fit into most halogen and xenon applications such as landscape lighting fixtures, desk lamps, puck lights, etc. 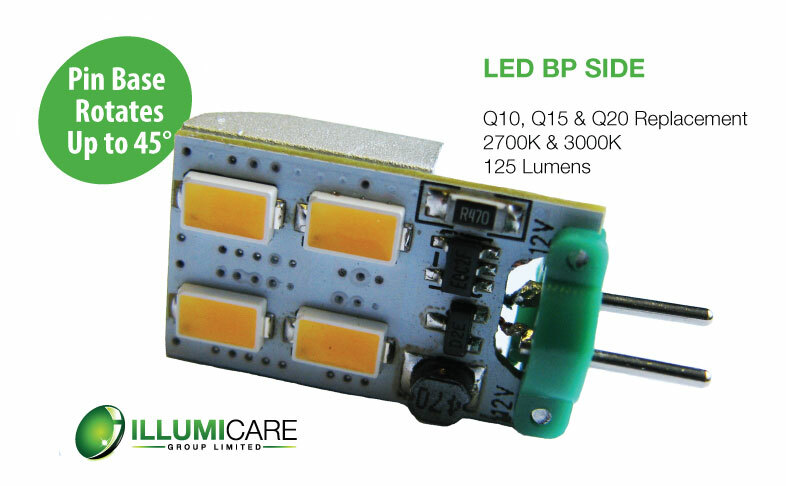 The Illumicare LED G4 BP SIDE replaces hot running halogen lamps with an efficient 1.6 watt LED light source. Download our Rotatable G4 Bi-pin Spec Sheet here. Base Types Available: Rotatable G4 Bi-pin, Pin spacing of 4 mm. Please note: This product may cause interference with other electronic devices. If interference occurs, please change the location of the products involved.